The Edmonton Convention Centre (SCC) is proud to host Art Night on Tuesday, March 27, 2018 from 4:30 – 7:00 p.m. The free, public event will feature work for sale from over 26 local artists and unveil the newest art chosen to be exhibited at Edmonton’s convention centre as a part of its community art program. In September of 2017, the Edmonton Convention Centre celebrated the second year of its community art program with an open call to local artists. Over 200 submissions were received from 70 artists and evaluated by a panel of judges from Edmonton Economic Development Corporation (EEDC). A total of 15 submissions from six artists will be unveiled on March 27 and exhibited at the venue for one year. All artists who made submissions to the Edmonton Convention Centre’s community art program have also been invited to showcase and sell their work during Art Night. Over 100 pieces will be on display and for sale by the artists. 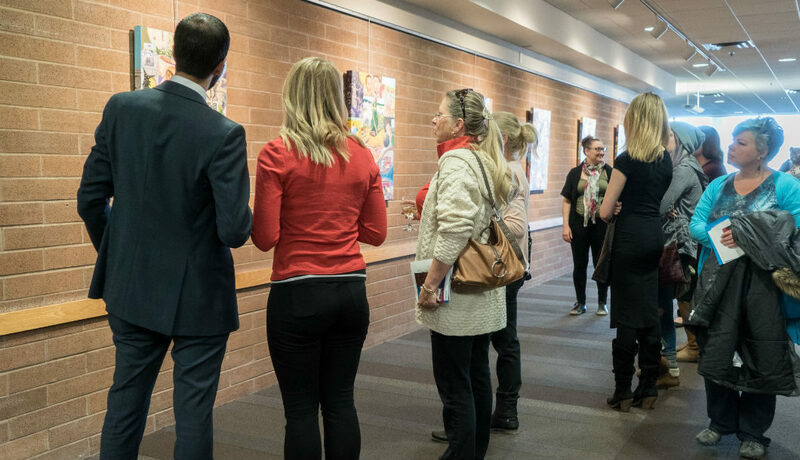 Art will be featured on all levels of the venue, with cash bar and appetizers available for purchase by the convention centre’s award-winning culinary team. For more information on Art Night, visit our event page or Facebook event. Managed by Edmonton Economic Development Corporation, the Edmonton Convention Centre has a vision to be one of Canada’s top performing convention centres by 2020. Everything we do is dedicated towards pushing the limits of providing the very best experience an event planner or guest has ever had, anywhere. Our team of event experts is ready to create a remarkable experience for you. Contact us today.